This summer, the Alamo Colleges District and all five colleges, are launching a new website for the benefit of our various stakeholders. Students, faculty and staff have the opportunity to preview the site before it goes live in mid-July. The primary focus of the new site is on first-time visitors, most often a prospective student. The language, flow and content aims to appeal to new visitors, many of whom are new to higher education. The intent is when a person visits alamo.edu or the NVC site, he or she should understand the content in a way that is relatable and understandable. Having a simple website will also benefit current students and employees as they navigate through the pages to access information. Shawn Harward, Northwest Vista’s senior multimedia specialist in Public Relations, who has been working on the migration to the new website, says that this is a great improvement in many ways, including mobile-responsiveness. Consistent: A consistent look, feel, and infrastructure makes the website ease of use. 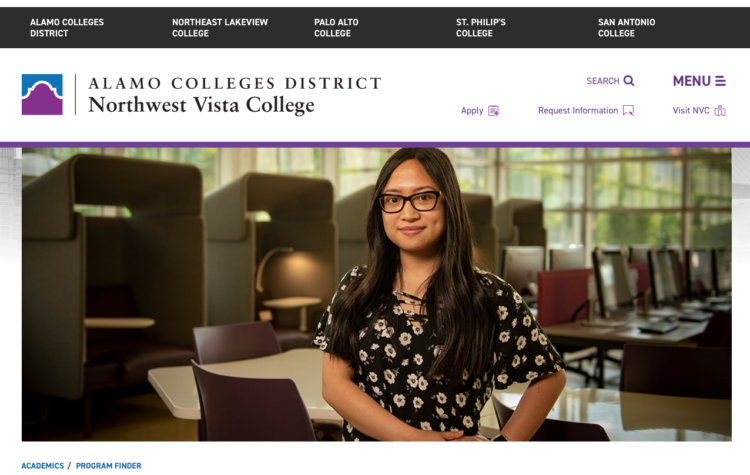 Students visiting Northwest Vista College will be able to find the same information in the same place on any of our sister college’s site. The Alamo Colleges District homepage and college landing pages are designed to reflect a consistent look and feel while allowing for individual identity. Simple: The website will remain simple and streamlined. The focus is on the audience and the intent it to give visitors a starting point for gathering more information. It is intended to connect the visitor with various resources that Alamo Colleges have to offer. Action-Oriented/Warm Handoff: This website promotes action on the visitor’s part: enroll, learn more, tour. The site introduces a topic and guides the visitor to either take an action or connect with an Alamo Colleges District expert who can guide the visitor through the process of taking the next step. Current/Credible: Visitors expect websites to have information that is not up-to-date. Content on the site will use of modules that automate or remove old content automatically. Mobile Responsive: Our demographic relies heavily on mobile devices. The site structure and elements focus on meeting the needs of mobile users. If you have any questions about the new website, contact Shawn at sharward@alamo.edu.